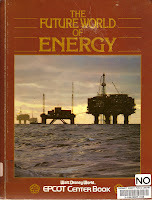 While paging through the EPCOT Center Book: The Future World of Energy, published in 1984, I noticed that even images demonstrating positive advances in the field of energy production took on a distinctly dystopian illustration style. The image below shows something the book's authors clearly believe to be an advancement in technology. But I can't then understand why it looks like a vehicle right at home in the dytopian world of Blade Runner. It seems that in the paleo-future, energy is still a dirty business. Power plants may someday grow their own fuel. Here, a harvesting machine is cutting trees and separating the wood that would be burned to produce electricity. I suspect that the illustrator was heavily influenced by Gerry Anderson shows as a child. 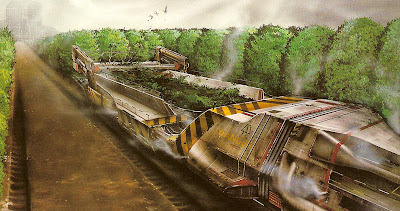 In particular, "Thunderbirds" shows a utopian paleo-future with lots of gently smoking chunky industrial machines. It looks a lot like a Chris Foss or John Harris. Whoever did it, it's a really terrifying image. The machinery may not look like that, but one only has to trip down to South America to see the real process in action. As an aside, we bought our son a book of construction vehicles drawn in a very simple, graphic style. At first we thought it was just a cute picture book, but upon multiple viewings it made me a little queasy. It tells the quaint story of tearing down old buildings and bulldozing trees to put up an office building. I guess some industrial-age themes never die.